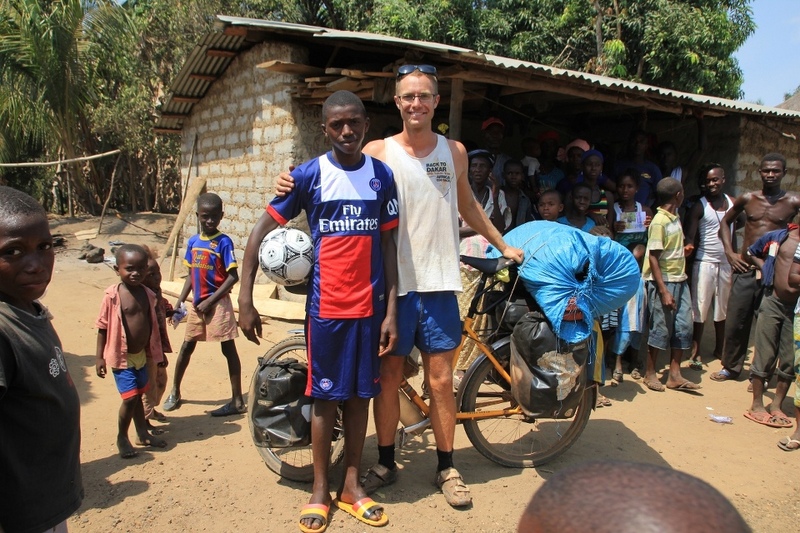 Cycling out of Guinea was easier said than done. A drunk army guy stopped me and said that I had arrived to the border, although I knew I was still several kilometers away. He wanted to see my “ordre d’mission”, and luckily I had prepared such a document. He started to slowly copy it by hand, but it seemed like he was only writing rubbish. Obviously, he was only waiting for me to offer him something, but instead I sat in silence with a discrete smile on my face watching the birds in the sky. Finally, he gave up and handed me all my documents in what seemed like slow motion. On the Sierra Leonean side, I was welcomed by smiling officials. 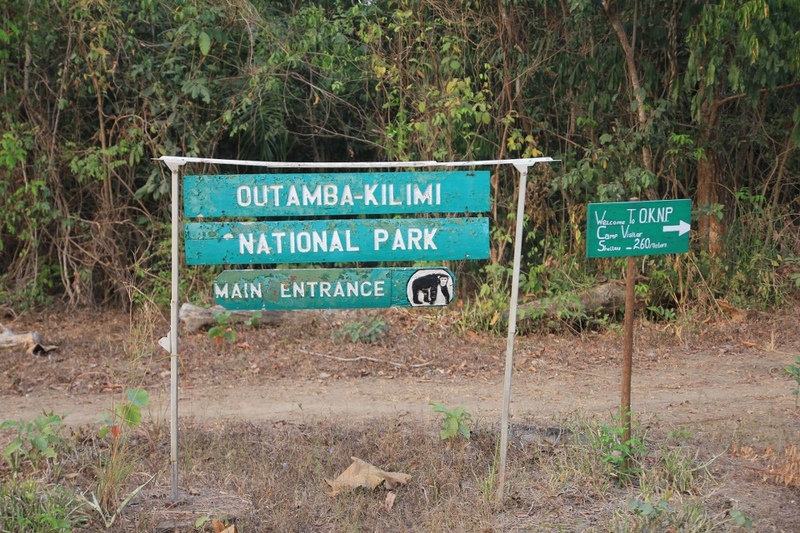 I continued on towards the Outamba-Kilimi National Park, which I reached just before dark. 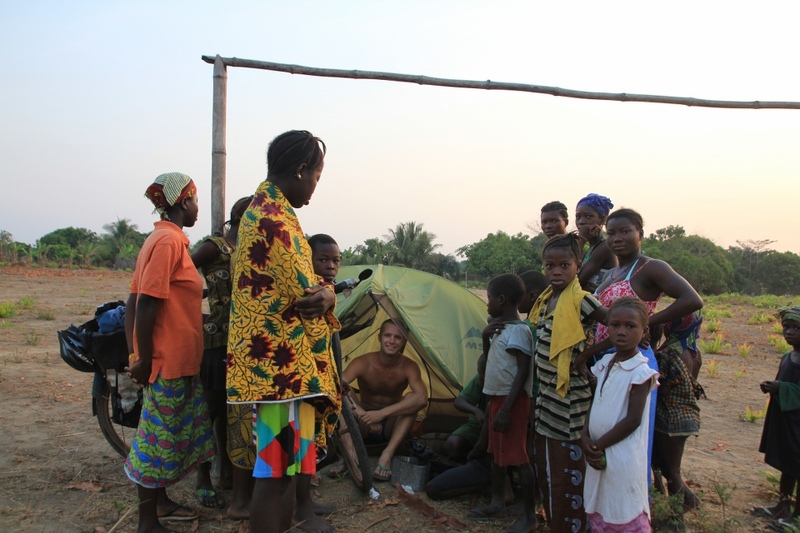 Here, I put up my tent in the basic camp and befriended a local biologist who gave me palm wine. It felt like I had entered another climate because here, the humidity of the dense jungle doesn’t evaporate as much as it does nearby more inhabited and cultivated land. It takes time to fall asleep with all the heat and humidity. I can stay in a kind of dozing condition for many hours before drifting off. 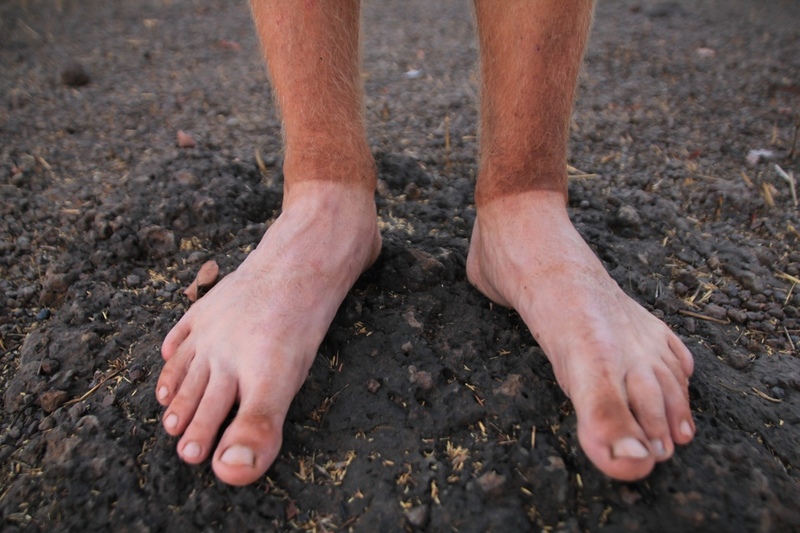 Usually, I have several intense scratching sessions during the night on all the insect bites that cover my legs. I know that it’s best to leave them, but I cannot control myself. The malaria medication also affects my sleep, and I can’t recall the last time since I started taking it that I didn’t woke up several times during the night. 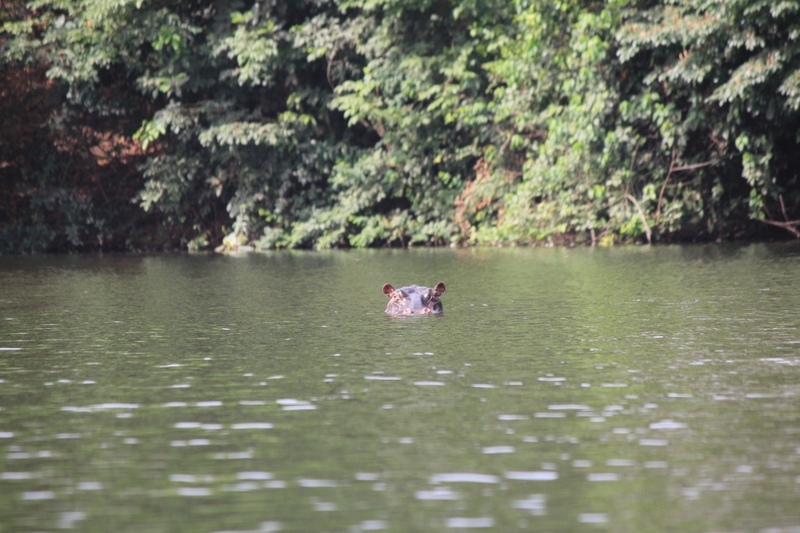 The following morning, I woke up early to go and see what most visitors come here to see: hippos. 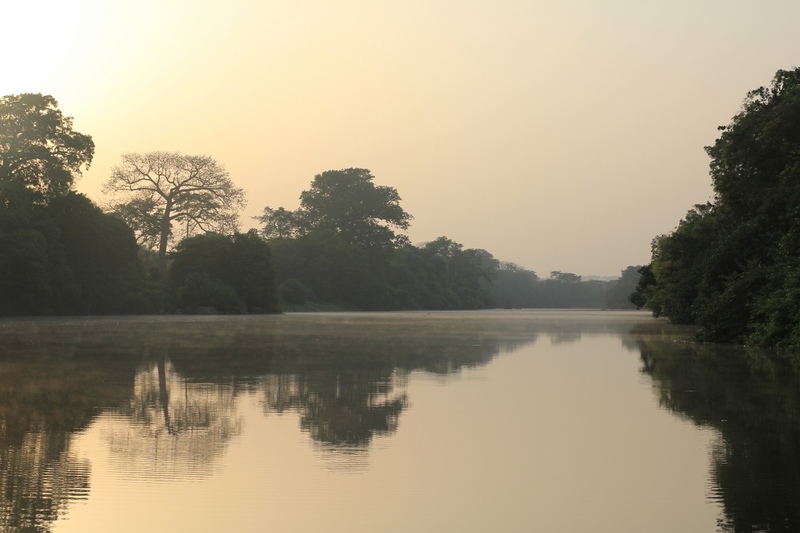 Together with a guide, we entered a canoe and set out on the river in the early morning mist. After about one hour downstream, we spotted a group of seven individuals! We stayed and watched them for maybe half an hour from a safe distance. Hippos spend the whole day submerged in the water to cool down and at night they walk up on land to eat grass. They are very cute when they wiggle with their ears! 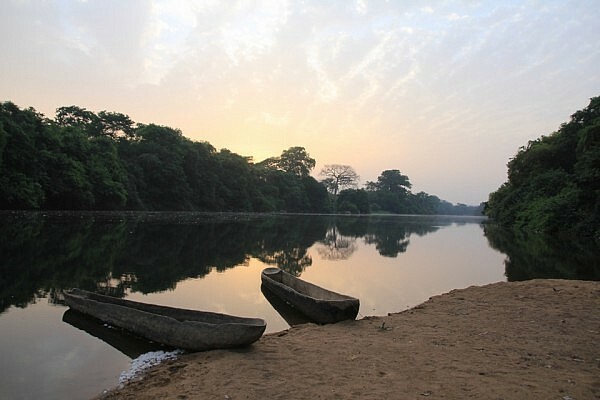 I got quite sweaty and tired from all the paddling and hadn’t taken a rest day for two weeks, so I did like the hippos and spent the rest of the day cooling down in the river and enjoying the tranquility of this place. 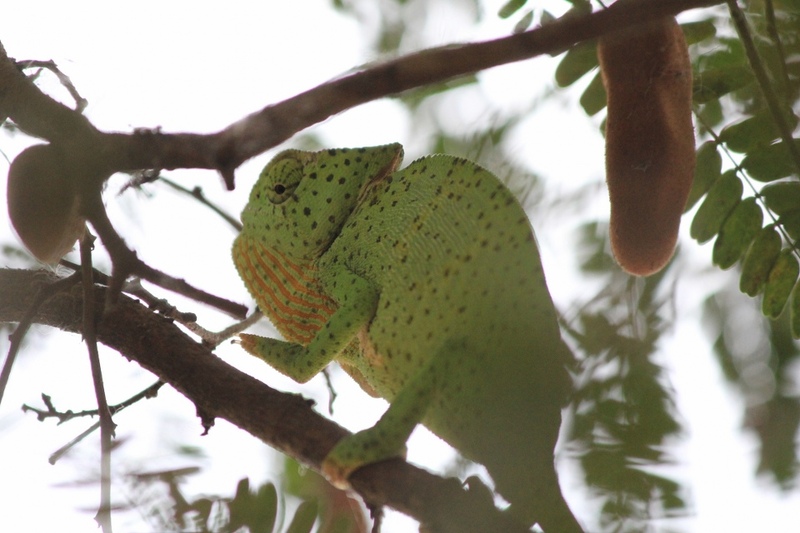 I took a short stroll to a nearby village and spotted a chameleon on the way. It’s a very interesting animal! Just like an octopus, it changes color and shape when it feels threatened in order to camouflage itself and blend into the environment. 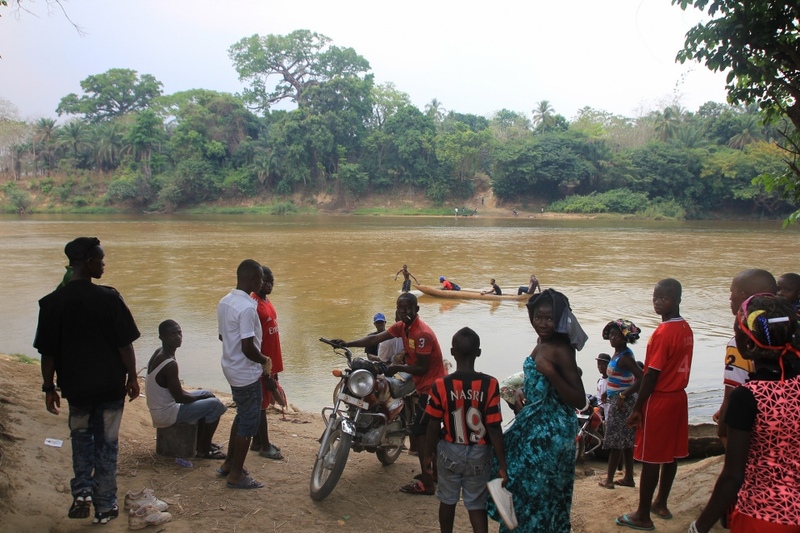 After the national park, I continued south to the city of Makeni where I decided to cut my hair. It had become too hot to keep it long. So after 9 months on the road, I looked just like I did when I set off from Gothenburg, except for being a few kilos lighter with bigger legs, thinner arms and darker skin. It never stops to amaze me how the body adapts to what you are doing. 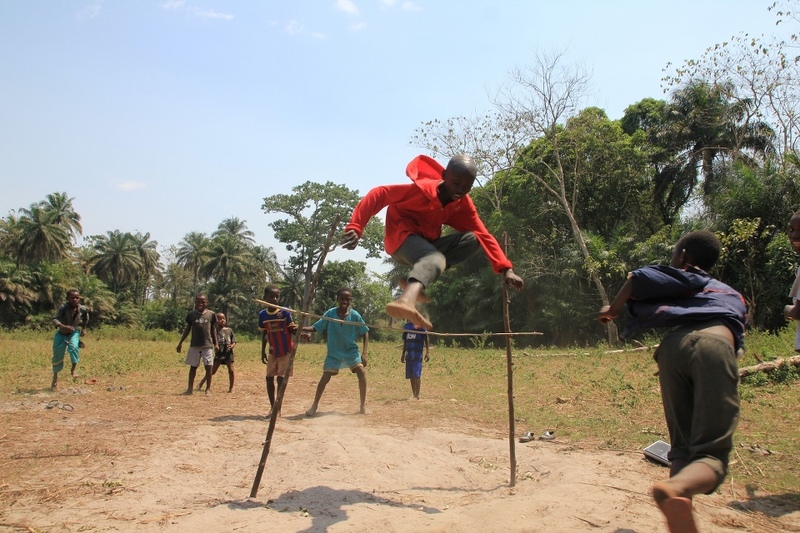 In and around Makeni, I saw the first signs of the recent civil war. It all started in the early 90s when the Revolutionary United Front (RUF) together with some of Charles Taylor’s guys from Liberia decided to take power over the corrupt group of military elites ruling the country. Several coups took place during the years that followed and different groups were formed, trying to establish new governments. 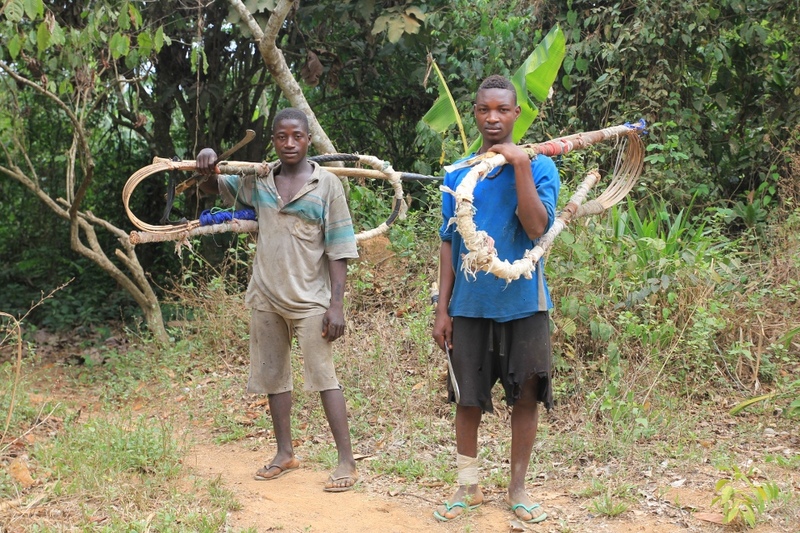 Young boys were often recruited by the RUF and rebels attacked civilians with firearms and machetes. 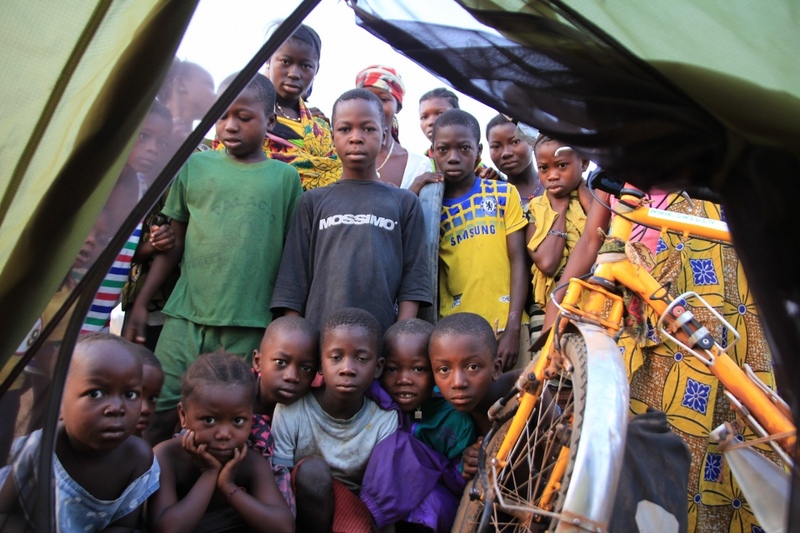 Peace was declared in 2002, only 12 year ago, with the help of a massive UN peacekeeping mission. The war killed between 50,000 and 300,000 people and left behind a devastated country, which quickly got ranked among the bottom on Human Development Indexes. 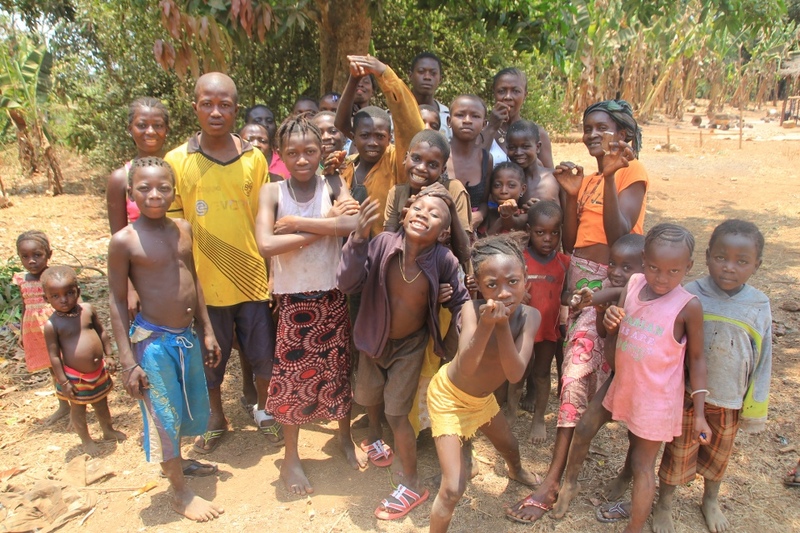 A couple of days after entering Sierra Leone, I was informed about an outbreak of the Ebola virus in southern Guinea. 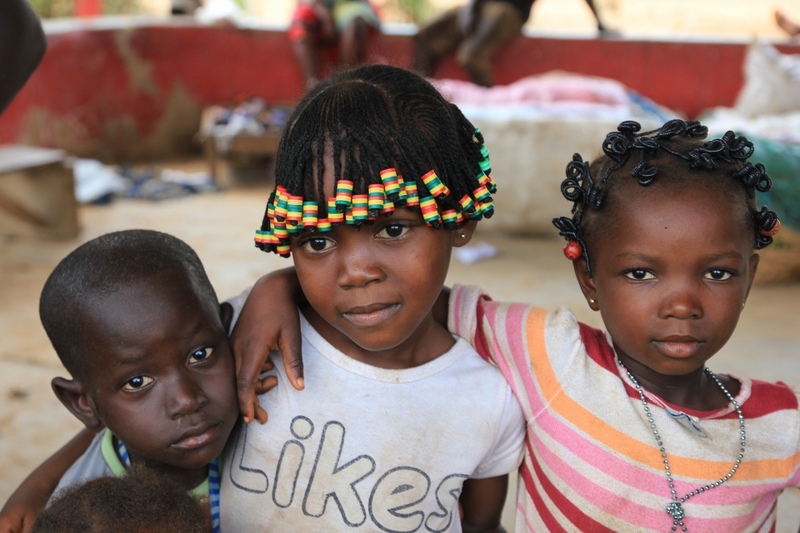 Even though Ebola is one of the deadliest viruses known to man, people didn’t seem too worried, and in the beginning you didn’t hear much about it in the news. But in only a few days, the whole thing escalated enormously and was referred to as an epidemic. 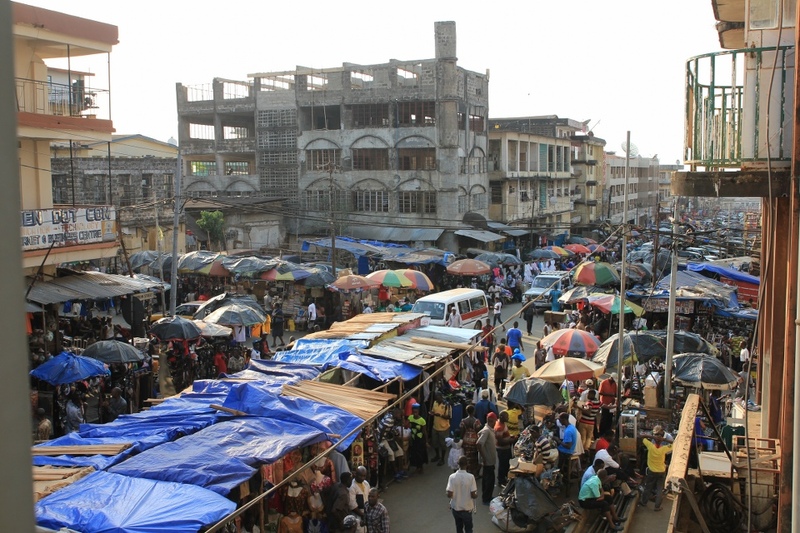 The virus had now spread to Conakry (the capital of Guinea) and leaving over 50 people dead already. Senegal shut down its border with Guinea, and after Liberia got its first cases confirmed, they too were considering closing theirs and declaring a “state of emergency”. 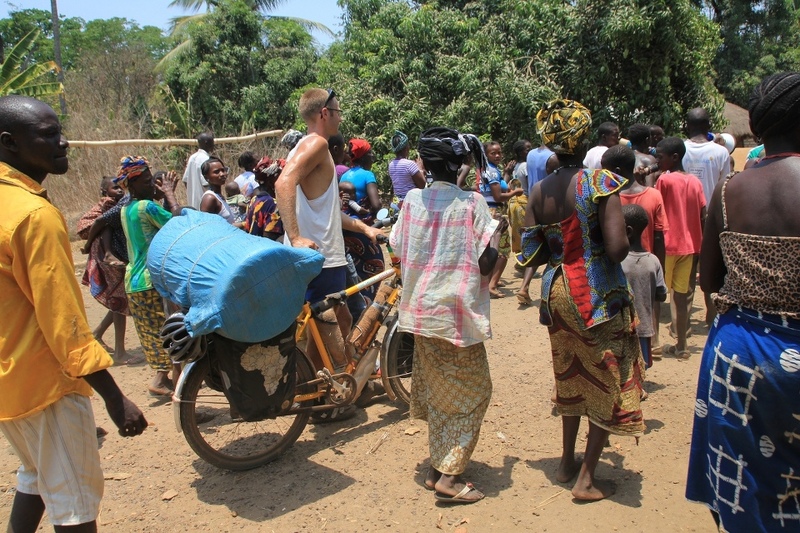 I could only hope that the disease wouldn’t spread into Sierra Leone, in that case I would be stuck! Ever since I left Sweden, I had planned to visit my sponsor child Momodu who lives in Sierra Leone. I contacted the organization PLAN in advance but it was more complicated than I thought to arrange a meeting. The local staff told me that it was difficult for the family to take a break from work since it was harvesting season. Instead, they suggested that the meeting should take place at the PLAN office. But this was not the way I had imagined this meeting! The next day, PLAN said that the Ebola outbreak might pose a threat to the meeting as well. Getting different explanations and a bad impression of the PLAN staff, I got a bit disappointed and sad, and decided to push on towards the capital Freetown instead. 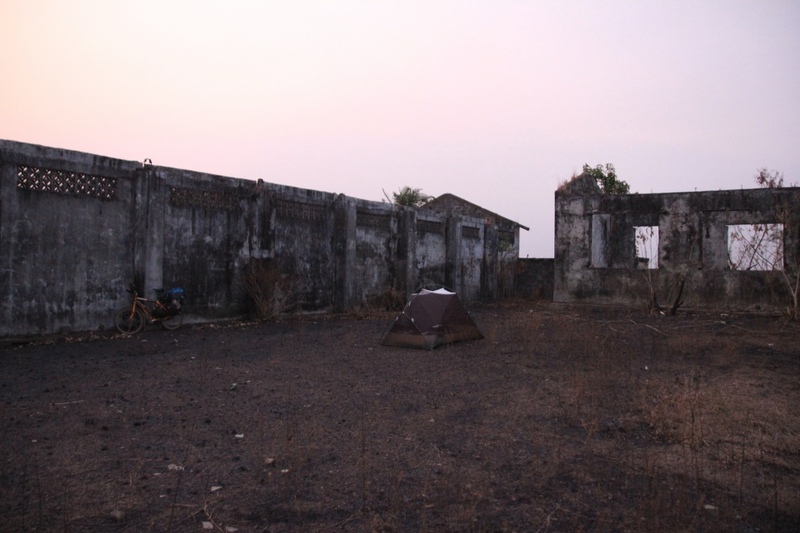 On the way, I camped next to a burned out farm that the rebels had destroyed during the war. I had an awful nightmare that night (thanks, Lariam!). I dreamt that everything on my bicycle just fell apart and broke down. And then, when there was almost nothing more to break, a guy stole it from me and got away with it. In my normal dreams, I always manage to run after and catch guys like him! This affected my mood in the morning, but things took a 180 degree turn when I discovered that it was pineapple season – fresh pineapples were sold along the road for next to nothing! The pineapples here still have a piece of the stem left on them, so I have discovered that they are best eaten just like a corn cob, with your hands on each side, and rotating it as you eat. On the highway from Mile 38, as I was about to enter the Freetown peninsula, I turned on the radio on my iPod and was instantly propelled forward by Haddaway and La Bouche and other artists from that era in this 90s eurodance marathon broadcasted on Africa Independent Radio. I decided to make a clockwise loop around the beautiful peninsula and was accompanied by green hills, white-yellow beaches and loads of coconut palms. It was much cooler here too, with a lovely breeze rolling in from the sea. 28 degrees Celcius to be exact, but in a place only 100 km’s inland where I was heading to next, the weather reporter informed me that it was 36 degrees with 90% humidity, making it feel like 43. I decided to stay in Freetown for a few days and recharge my batteries. I found the city quite nice, with loads of people, markets and general chaos. Delicious Lebanese food (there are loads of Lebanese people running the show in West African cities), Chinese supermarkets and a Liberian embassy. I spent the days eating, repairing things, blogging and watching the last season of Breaking Bad on my portable projector that painted Walter White’s blue meth onto the already blue hotel room wall. One night I decided to check out the nightlife and headed to the eastern suburbs in search for a bar where I could meet some locals. I have to confess that I love the feeling of in a new, big city, slightly tipsy placing myself on a motorbike behind a driver that I don’t know who drives like crazy through the night and zigzags past traffic – and then close my eyes. It beats all roller-coaster rides! Anyway, we got to a place where I sit down to have a beer. After five minutes I see something white moving in the corner of my eye and before I even have time to blink, a plastic table comes flying with an incredible speed and hits my table. At the same moment, chairs flew away and car alarms set off. 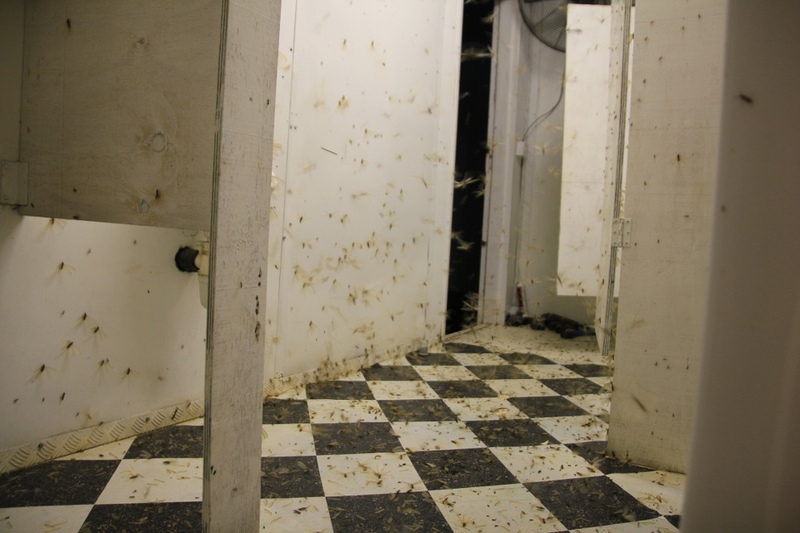 It was a gust wind or tornado that took the whole venue by surprise. Most people got a bit scared except for me, who sat there completely fascinated by the force of the wind and at first not noticing that I had the whole beer in my lap. I decided to go somewhere else after not having made conversation with others than a handful of prostitutes. Instead I went to a place called Liberia Bar, but this place was full of tattooed and muscular gangsters. I ordered something to eat and got a soup so spicy that it gave me hiccups that never seemed to stop. That was it, I went back to the hotel and fell asleep. It seemed like the visit of my sponsor child would take place after all and I started to hear positive news from PLAN. So instead of heading east, I took the ferry across the bay and arrived to the PLAN office in Port Loko the following morning. Here, I was invited to have breakfast with the staff before we headed towards the village where Momodu (aged 15) and his family lived. I wanted to cycle there of course, but PLAN insisted on putting the bike on top of the car to save time. 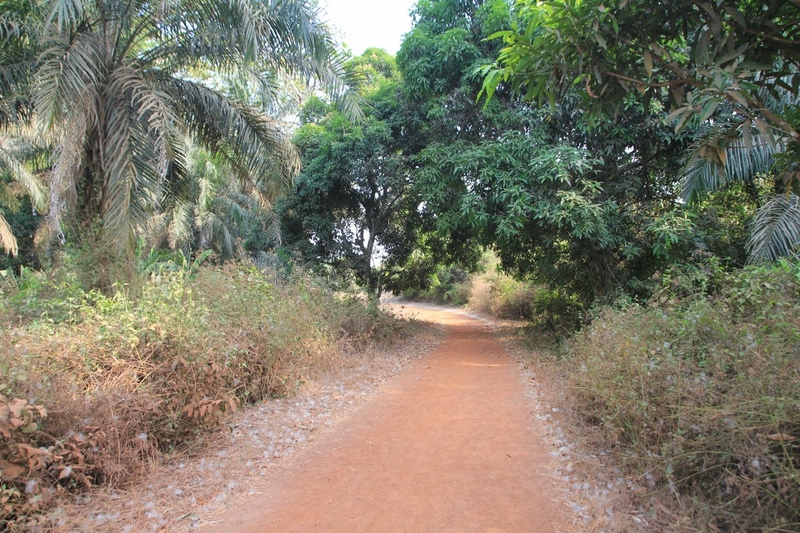 Whatever… They dropped me off in a village nearby and I cycled the last bit, which was only a narrow path. I was taken by surprise as all the villagers welcomed me by playing instruments, singing and dancing. It was actually quite touching! Finally, Momodu appeared but he was not the same guy that PLAN had sent me photos of (nice job). Anyway, he was very sweet and super excited about meeting me! The villagers had arranged with tables and benches and prepared fruit and other things as gifts for me. We all sat down and then followed a series of speeches before exchanging our gifts and then the people showed me around in their little village. This was the first time a sponsor visited this community. 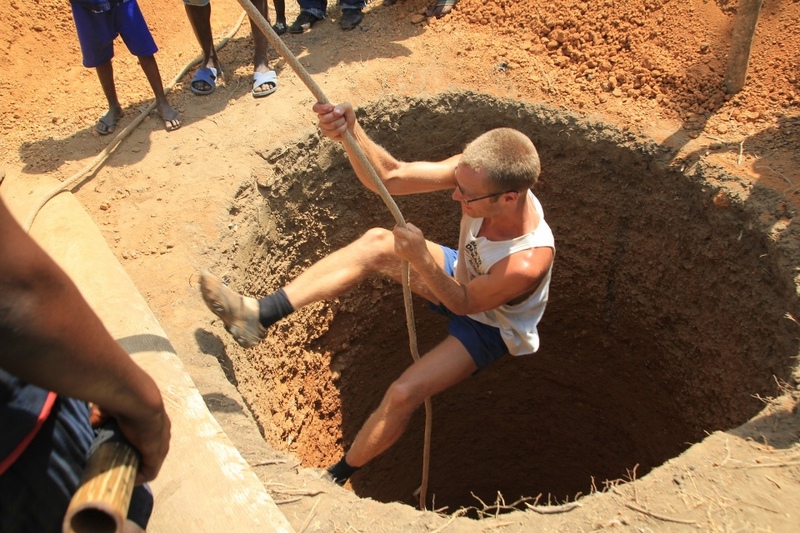 And only one week before my visit, PLAN had started the work of building a well here. 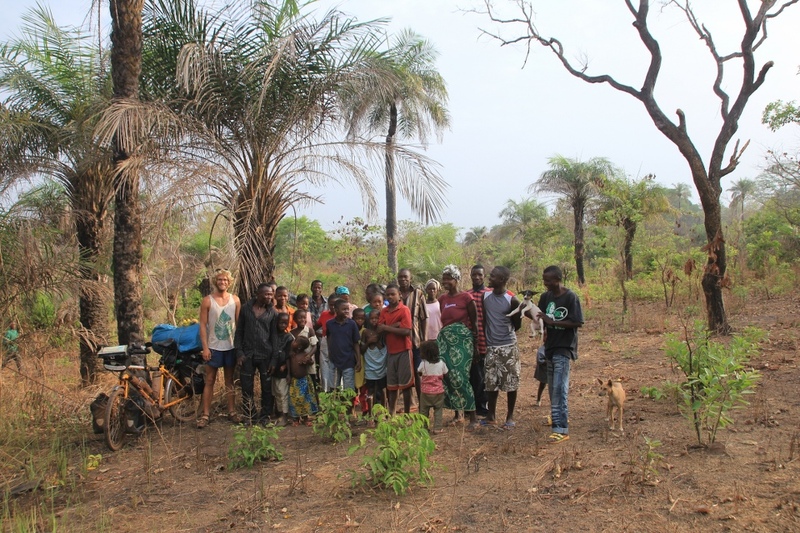 Since this coincided with my visit, I’m pretty sure that it was because of that I was coming and I was happy to feel that I had made a difference for these people, who currently had to walk a bit to an open water source that didn’t look very clean. 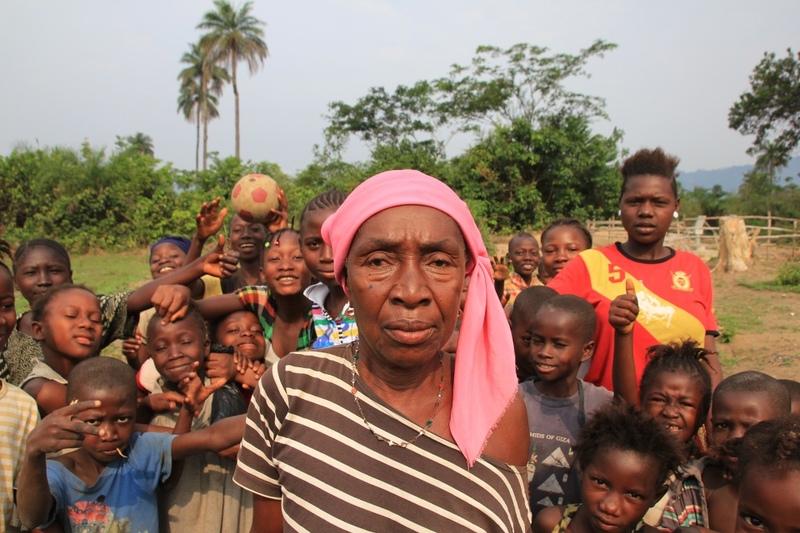 I left the village as quickly as I had appeared (the PLAN staff seemed to have gotten impatient because the villagers had raised a concern about the hospital being too far away). But overall, I was very happy that the meeting took place and that the community soon would have a brand new water pump installed. The following days offered some lovely cycling. I made up the route spontaneously and asked locals about small roads taking me east. Sometimes I cycled on footpaths and I crossed the clear Rokel river in a canoe twice. I cycled through industrial-scale sugarcane plantations used for producing ethanol and got my tent floor eaten away by hordes of termites. 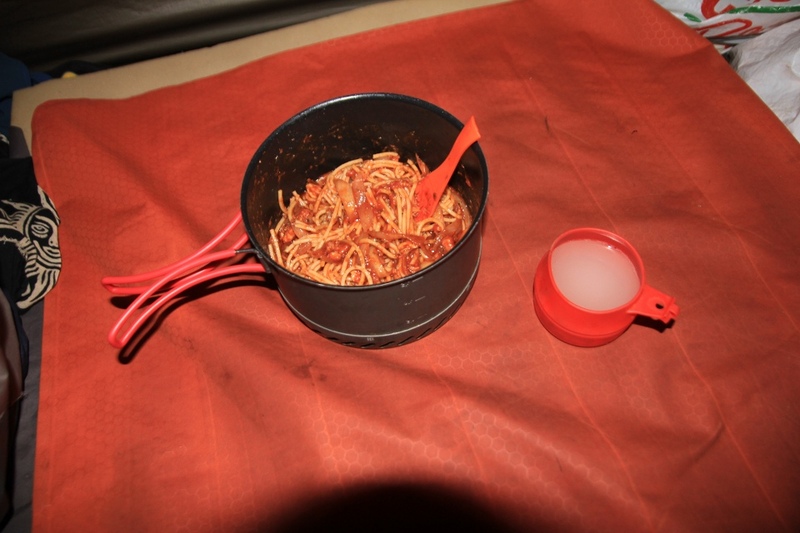 I guess the optimist would say that this helps minimizing the weight… After some days, I re-appeared at a junction near Makeni where I had been ten days earlier looking for a camping spot, which was a funny feeling. I continued east and passed many villages partially destroyed by the war, with many ruins and sometimes with people missing their arms that had been cut off at different lengths. 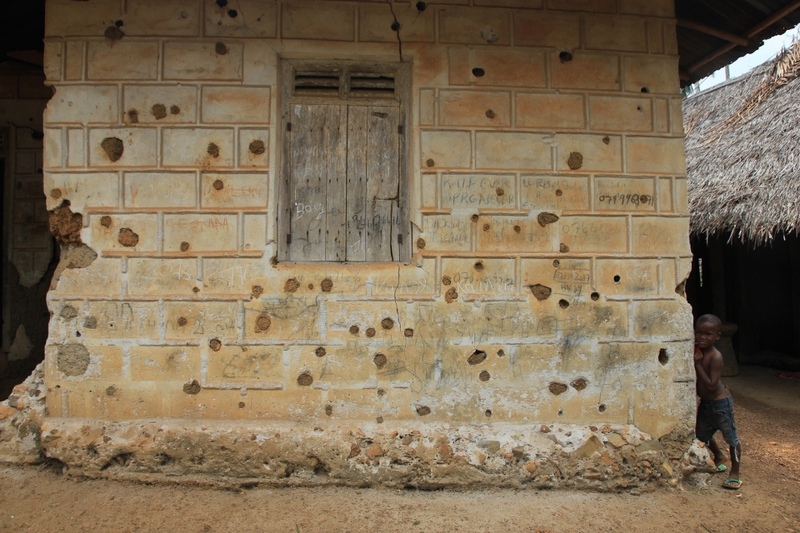 Bullet-sprayed house walls were a common sight. Talking about the war was not something that happened often, but when I sometimes asked, I was told the most horrible things. Like rebels forcing mothers to put their babies into the mortar and then pound them to death, or men being dragged behind cars until there was not much left of them. Or the story about an old man who was forced to sing and dance in front of a group of drunk rebels until he died of exhaustion. During the war, rebels usually lived in schools and used the furniture as fire wood. This is why PLAN’s projects in the country have mostly been about re-building schools and bring basic education back to the people. 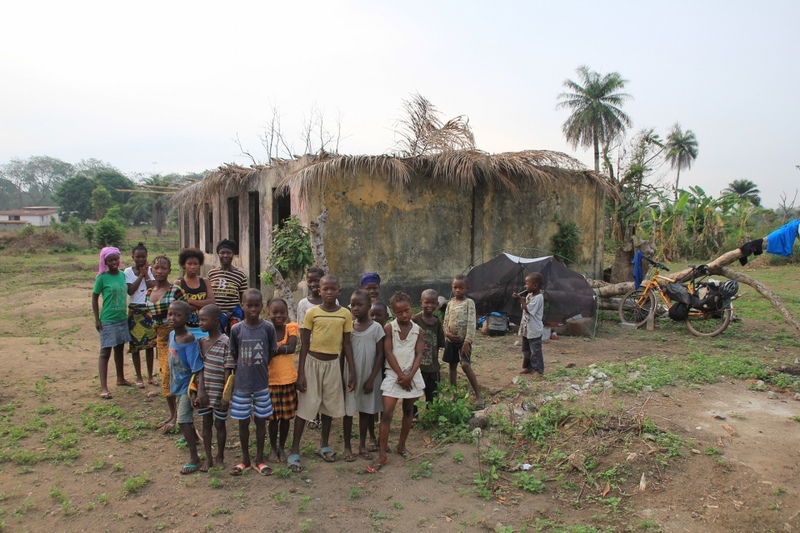 In total, 1,270 schools were destroyed in the war. 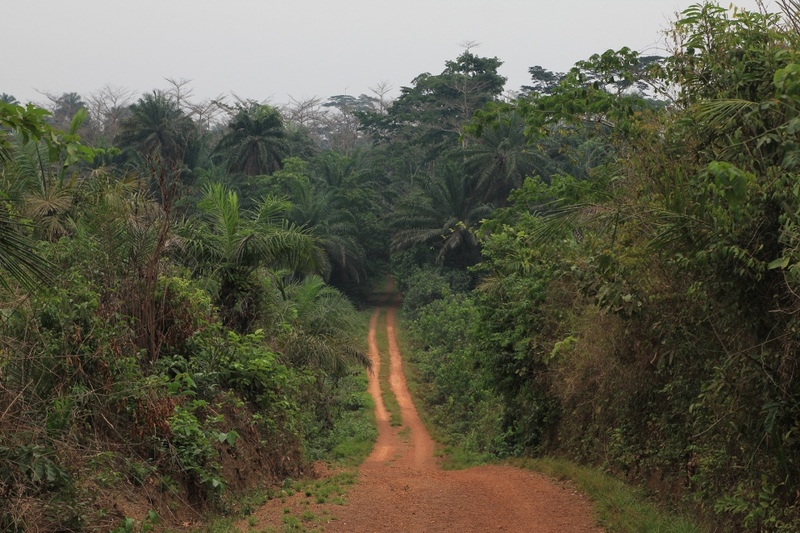 Eventually I entered the more hilly and very scenic Kono District. This area is famous for having a lot of diamonds and was full of rebels from the RUF during the war since diamonds basically funded their activities and weapon purchases. It is from situations like this that the terms “blood diamonds” or “conflict diamonds”/”conflict minerals” comes from. Perhaps some of you have seen the movie Blood Diamond. 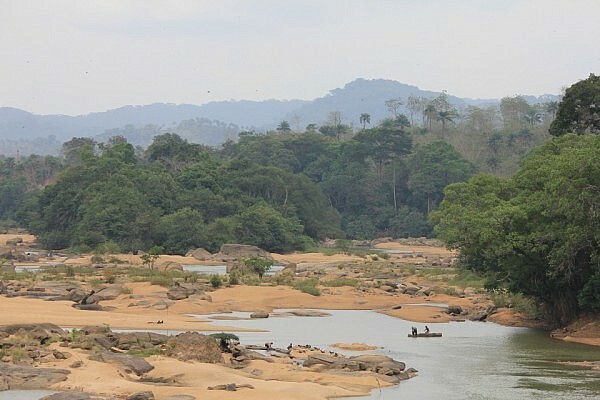 Although the movie depicts Sierra Leone and this particular district but wasn’t actually shot here, it felt like I was entering the same place. One day, I came to the beautiful Sewa River that is the river where in the movie Solomon found the big pink diamond. From the bridge, I could see loads of people working along the sand banks. Since collecting minerals was one of my biggest childhood hobbies, I got very excited about all this activity! I parked the bike and went down to the river to see what was going on. I met a group of people who were looking for gold. Diamonds too, of course. 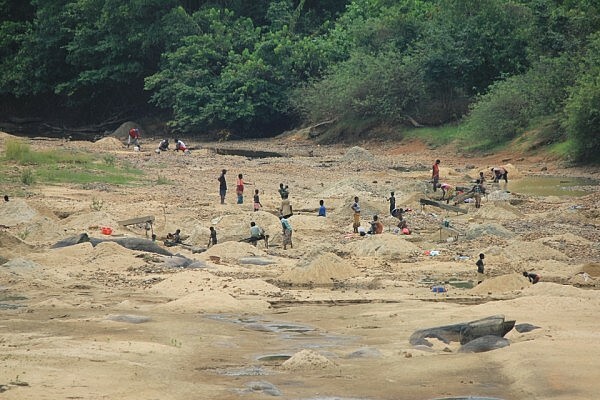 There are no gold nuggets here and the people had a clever way of extracting the gold from the river sand. They scoop up sand onto a 1.5 m long and inclined wooden trench covered with a thick hairy rag with wooden stoppers, which they then pour water through. 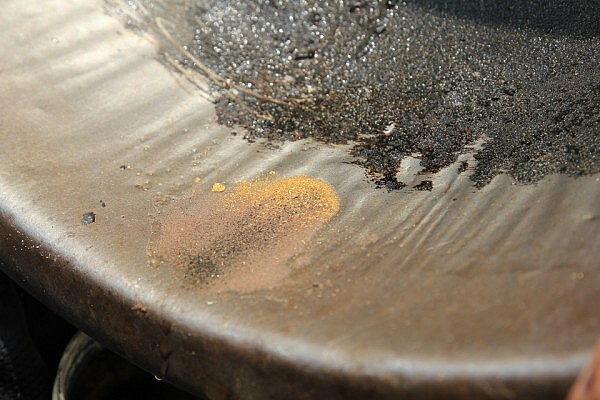 After a while, they remove the rag, washes it and pours the washing water and the particles that were trapped in the rag into a homemade pan built from a metallic bowl covered with something that I think was tar and sand, making it feel like sandpaper. 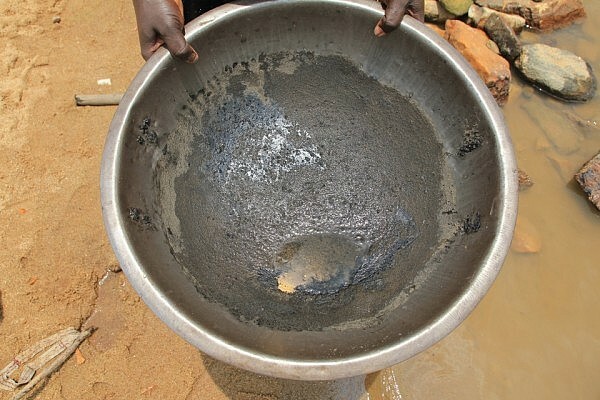 Then they extract the gold by traditional panning, and sell it for 5 euros per gram. I continued a little bit and came to an industrial mining site where I was told there were some white people who recently had started a diamond mining business. I approached the security guard trying to arrange a visit out of pure curiosity. The person in charge, a Namibian geologist, was not there at the moment but I got directions on where I could find him and how to get there. 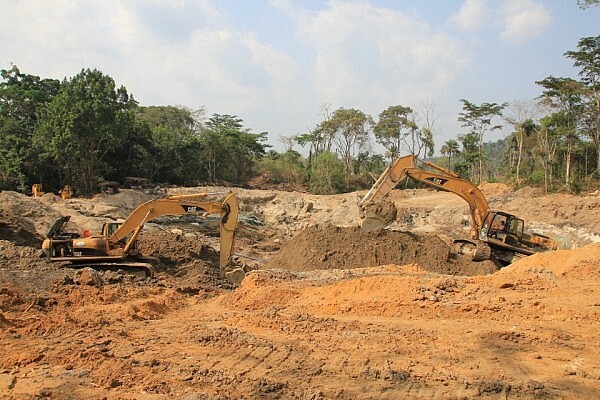 He was currently working at an excavation site a couple of kilometers downstream. When I got there I was well received and excitedly told that they had found what they thought was a small prehistoric lake where the river used to flow. 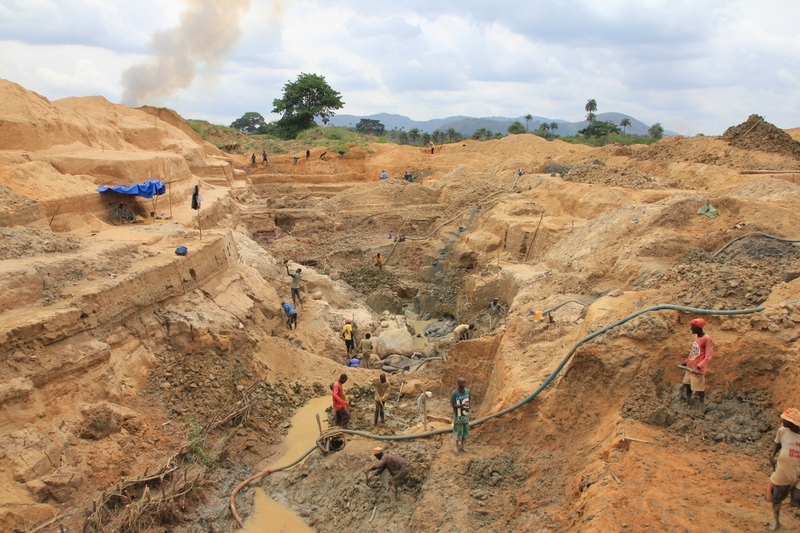 Some historical records had shown that artisanal miners had found diamonds here before, and now with the help of caterpillars and pumps, the pit was being emptied from its precious gravel. 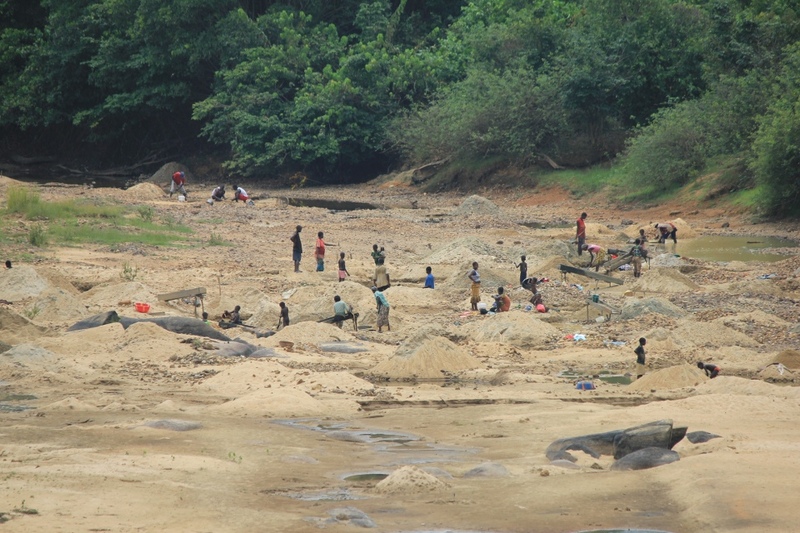 People worked hard, because the rainy season would soon arrive, making it difficult to dig. 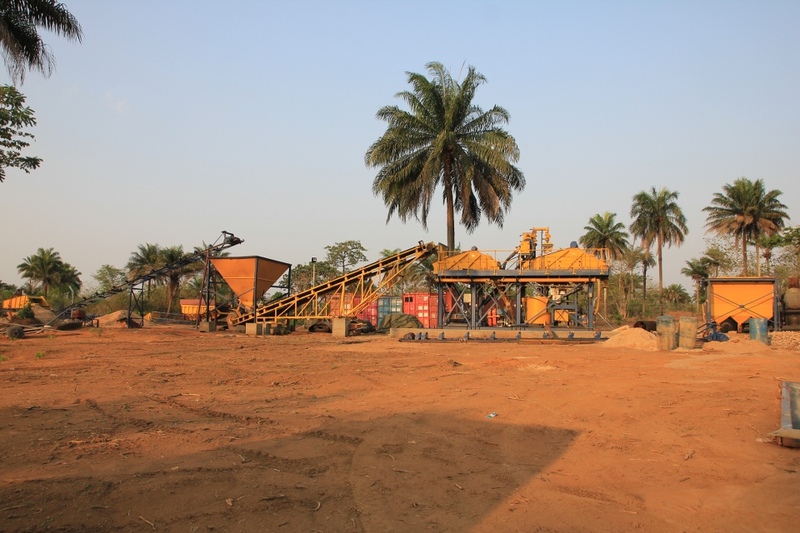 So as much gravel as possible was now collected from multiple sites and transported back to the camp, where currently a washing plant was being constructed. I asked if there was any possibility for me to see the plant and I was welcome to do so. 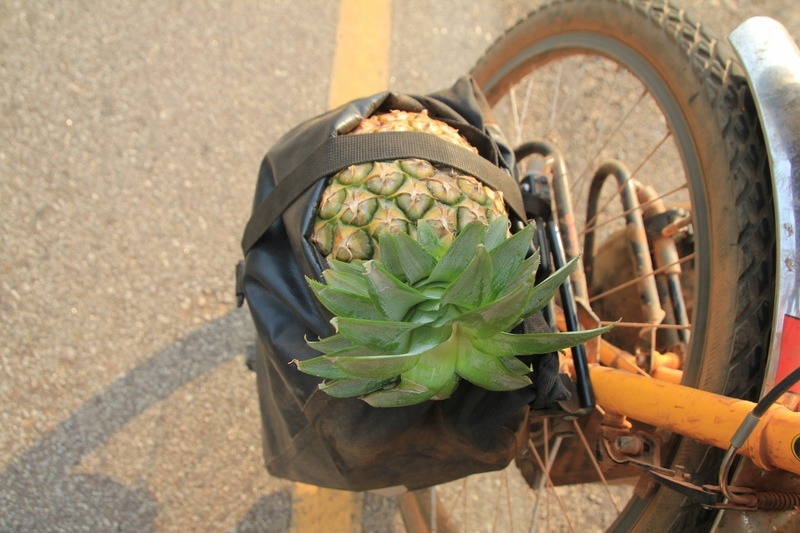 We put my bike in a golf car and drove back to the first place I had come to through newly constructed jungle roads. Here, I met a South African engineer who was an expert in building diamond washing plants. He had worked in places like Angola and Congo before coming here, and had seen both the good and the bad sides of this exceptionally lucrative business. 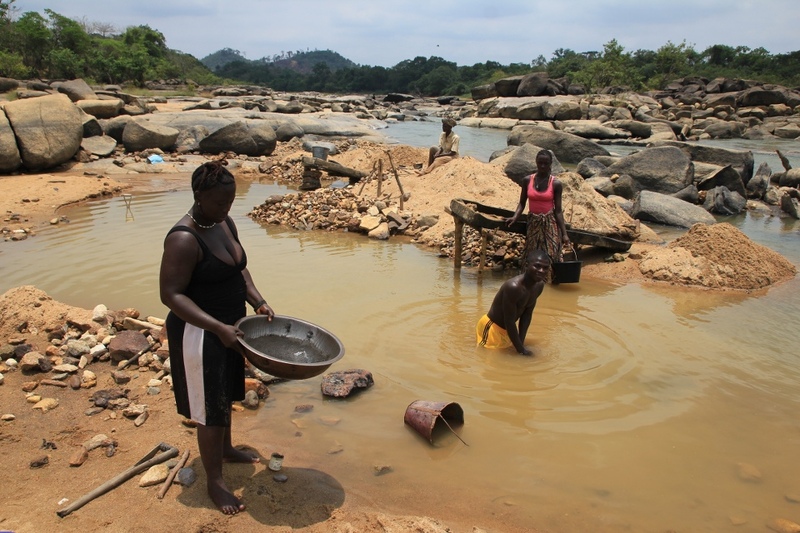 He showed me photos from a very productive mine in Angola where stones of 200-300 carats had been found, each worth around $12 million. He gave me a tour through the area and I was shown how a diamond washing plant was constructed. Basically the gravel is washed and then filtered to the correct size (1.5 – 35mm). Then it enters a machine that further filter the small stones based on their density. Finally, an “x-ray machine” spots the diamonds based on fluorescence, whereby if detected, a small hatch opens and shuts and the diamond falls into a safety box that is opened for inspection by the end of the day. The fine sand coming from the plant is further treated to extract the gold, providing a good source of income on its own. 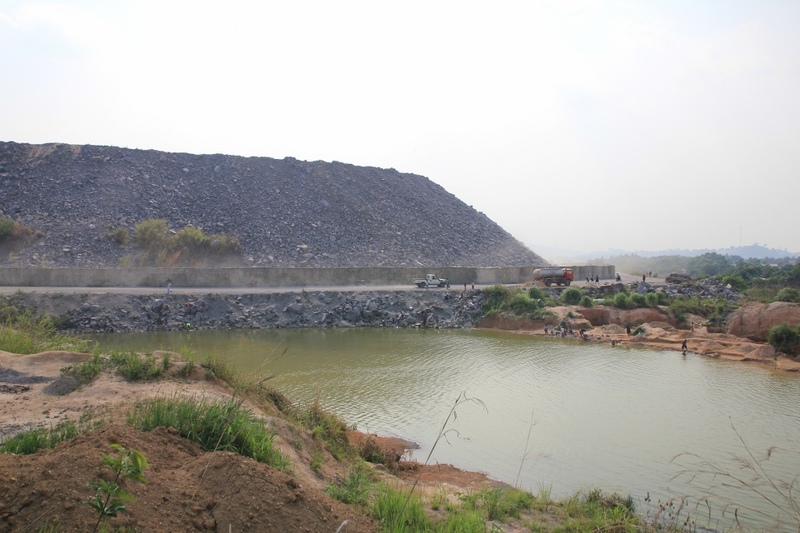 After this interesting tour, I came to the mining town of Koidu. 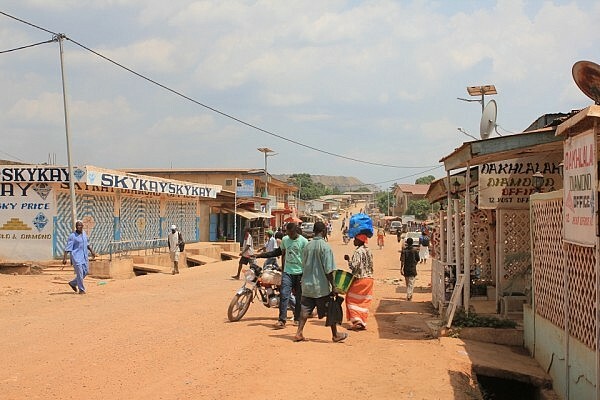 This town has kimberlite pipes running straight through it and is home to West-Africa’s biggest diamond mine run by a company called Octéa, which is owned by the Israeli billionaire Beny Steinmetz who lives in Switzerland. The streets were full of diamond dealers (many Lebanese). I entered one place and asked if I could see some stones. It’s crazy that these small things can be worth so much money! I recalled the beginning of the trip when I was in Belgium and visited the Jewish diamond quarters in Antwerp. Maybe these stones would end up there one day. On my way south of town I met a young boy on a bicycle who told me that he had found a stone from which he had bought this bicycle and now financed his studies. 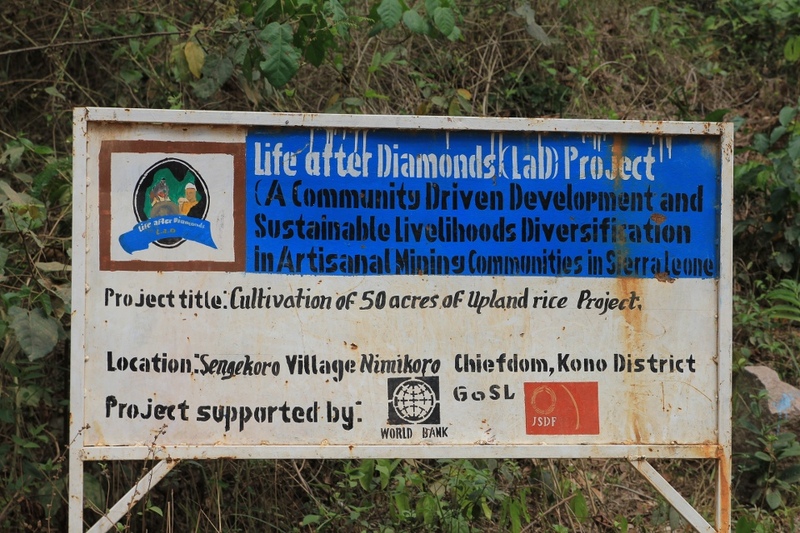 Diamonds are a big part of people’s lives here, and you see that the soil has been processed in many places. After some nice cycling through the mountains I arrived to the Tongo fields, another mining site. It was a big valley where people were digging everywhere. This place felt quite rough though, and I reckon there was not much control of who owned what piece of land but rather survival of the fittest was the ruling law. 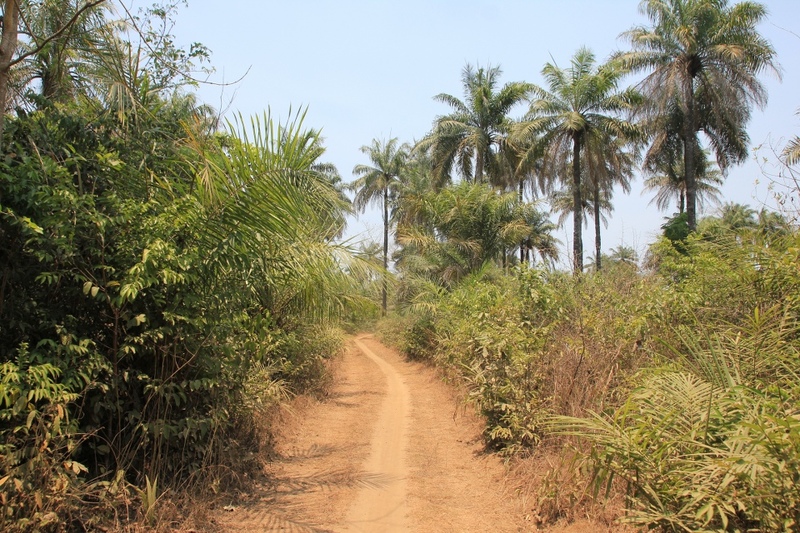 I headed towards Kenema and cycled up and down the hilly terrain when I suddenly felt a wonderful perfume and thought where is the woman with this lovely scent, but then I passed a tree with colorful flowers and realized that nature’s own perfumes are the best. I quickly put on The Lumineer’s “Flower’s In Your Hair” on my iPod before going down the next big hill with a smile on my face. Lika trevligt att få läsa dina brev varje gång, tänk vad mycket du får uppleva. Jag blir så inspirerad att jag har bokat färja Sthlm-Åbo, sen cykel till Helsingfors och sen färja hem, 6 dagar semester. Jag får njuta i det lilla. Allt gott till dig Calle! Hej Calle. Vilka otroliga upplevelser du haft hittills och t ack för dina intressanta berättelser. Måtte allt gå dig väl i fortsättningen, dessa krigshärjade länder är fjärran från svensk trygghet. Bon Voyage. Quel plaisir de lire tes aventures en Afrique. 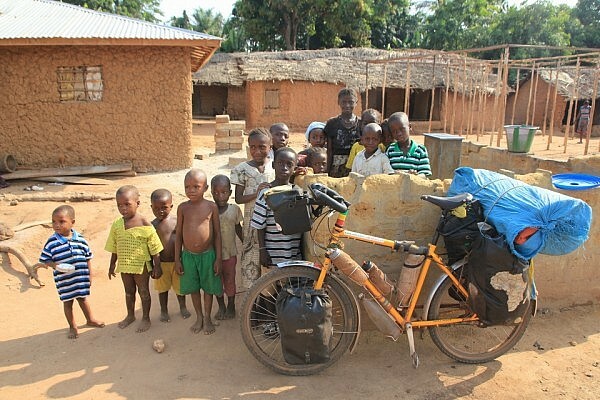 Je pratique le VTT et je connais quelques uns des pays africains que tu traverses. Merci de me faire rêver. Je suis l’oncle de Lucas, un de tes amis français. Gilles / Clermont-Ferrand / France . What a pleasure to read your adventures in Africa. I practice mountain bike, and I visite some of the african countries you go through. Thanks for making me dream . Have a nice journey, and take care of you. ps: I’m the uncle of Lucas, one of your french friend. Var fortsatt rädd om dig! Vilken tur jag har som fick upp ögonen för dina nyhetsbrev.Vi känner inte varandra men jag vill berätta för dig om den nyfikna glädjen i att trots det kunna följa din resa. Hej Calle, känns som en evighet vi träffades kort på Björnholmens marina innan du stack iväg på ditt äventyr, grymt kul att följa dig, kämpa på. En fantastisk resa, är genuint imponerad av din drivkraft och mod för att ge dig iväg på en sådan här resa.